A holy warrior fighting back infernal beasts on the precipice of a fiery pit. Cloaked figures chanting an incantation to bring forth a nameless beast. A man standing at a crossroads bartering with a demonic temptress for fame and fortune; the price of which is his very soul. Advisers to kings and queens, dictators and presidents, whispering lies at the behest of their demon lords with the fate of nations resting on whether or not the advice is heeded. A scientist examining a strange artifact found on a distant planet that, unbeknownst to him, opens a mysterious gate to a nightmarish dimension when a button is pushed. These are just a sampling of the myriad images which come to mind when we think of Hell. 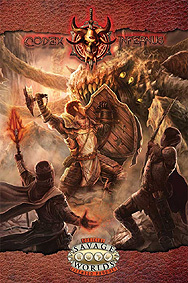 Codex Infernus: The Savage Guide to Hell, brings those images to life and shows you how to plug them into your games, regardless of what genre you love to play!